Contains info about various FileCheck options. Definition at line 26 of file FileCheck.h. Definition at line 34 of file FileCheck.h. Definition at line 31 of file FileCheck.h. Definition at line 27 of file FileCheck.h. Definition at line 33 of file FileCheck.h. 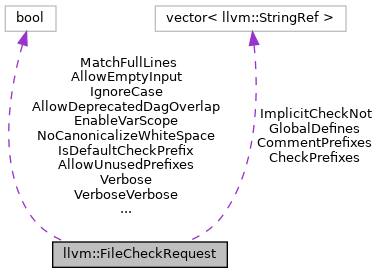 Definition at line 30 of file FileCheck.h. Definition at line 29 of file FileCheck.h. Definition at line 32 of file FileCheck.h. Definition at line 28 of file FileCheck.h. Definition at line 35 of file FileCheck.h. Referenced by llvm::FileCheckString::Check(), and PrintMatch(). Definition at line 36 of file FileCheck.h. Referenced by llvm::FileCheckString::Check(), llvm::FileCheckString::CheckNot(), and PrintMatch().